Get your feet wet buying shares of these three solid businesses. With literally thousands of options from which to choose, it can be an intimidating task for new investors to sift through all the intriguing businesses our stock market has to offer. But finding the best stocks doesn't have to be daunting. To help get the ball rolling, we asked three Motley Fool contributors to each pick a cheap stock they believe could serve as a starting point for rookie investors to build their portfolios. Todd Campbell: It may be tempting to invest in that speculative biotech with the early-stage game changer, but a better way for new investors to dip their toes into this complex industry is to focus on bellwethers with a been-there-done-that pedigree. Gilead Sciences' (NASDAQ:GILD) record of developing and launching billion-dollar blockbuster medicine is envy-inspiring, and given that sales are roughly $30 billion and the coffers are stuffed with $24.6 billion in cash, there's plenty of financial firepower handy to advance new drugs to market. The company makes its money selling market-share-leading therapies for HIV and hepatitis C, and new medicines in those indications are likely to keep them atop the podium. In the pipeline, the company's got intriguing drugs targeting multibillion-dollar indications, including non-alcoholic steatohepatitis, an increasingly common cause of liver failure, and rheumatoid arthritis, a multibillion market. 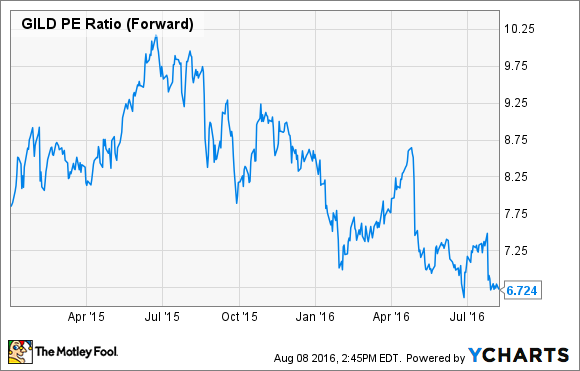 What makes Gilead Sciences even more attractive, however, is its price. A slowing in top-line sales growth stemming from a maturing market for hepatitis C has led to investors shunning the stock for faster-growing peers. However, that short-term thinking could be creating a great long-term opportunity for investors. Despite the fact that the company works on a packed pipeline of potential new drugs, investors can buy this stock for only 6.8 times forward earnings. That's incredibly cheap for the industry, and it marks a multiyear low valuation for the company. Daniel Miller: Being a rookie investor, and there's no shame in that, means you have a lot to learn about the market. That takes time. In my opinion, that means one of your first investments should be in a larger company with competitive advantages, that isn't being displaced by competition any time soon. One company that fits the bill is definitely The Boeing Co. (NYSE:BA). Boeing's competitive advantages are rooted with the commercial aircraft industry itself. It takes a long history of technical knowledge to design, assemble, and certify commercial aircraft. Boeing operates the majority of its business in a highly regulated industry that few newcomers dare to try and break into -- when it comes to commercial aircraft, it's basically Boeing, Airbus, or bust. Another perk for Boeing investors is the company's huge backlog of orders. It takes years to build these aircraft, and when demand is strong, so is the company's revenue visibility. Consider that Boeing has a backlog of over 5,700 commercial aircraft, which is basically five years of revenue. One of Boeing's goals during the near term is to continue ramping up production of its commercial aircraft. Boeing's 737 is a prime example: Its production per month will increase from about 41 planes currently to 52 per month in 2018. On top of it all, Boeing has another catalyst with its defense business. It's been a tough area over the past few years as U.S. defense spending has been slashed, but the bottom of that cycle appears to have arrived, and if government spending returns, Boeing stands to benefit. All in all, Boeing has a well-protected business, a robust backlog, a potential catalyst with its defense business, and it's trading at a forward price-to-earnings ratio of about 13, according to Morningstar estimates. With these characteristics, it's a pretty strong candidate to own in a rookie investor portfolio. Steve Symington: I think now is a great time to pick up PayPal (NASDAQ:PYPL). Shares of the digital-payments platform leader plunged last month despite not only turning in stronger-than-expected second-quarter 2016 results, but also raising its full-year outlook. Adjusted revenue jumped 16% year over year (19% at constant currency) during the quarter, to $2.65 billion, and PayPal highlighted the fact it gained market share during the quarter, with total payment volume jumping 29% year over year, to $86 billion -- significantly faster than the overall growth rate of the e-commerce industry. But investors were more concerned with PayPal's simultaneously expanded strategic partnership with Visa, under which PayPal agreed to stop directing its customers to link bank accounts instead of credit cards to its platform. Because Automated Clearing House (ACH) transfers are cheaper for PayPal to facilitate than credit card transactions, this could mean PayPal will be facing margin pressures in the near term. But the agreement also gives PayPal access to Visa's tokenization services for in-store PayPal transactions, which will accelerate adoption of PayPal's digital wallet to all physical retail locations where Visa contactless transactions are accepted. Over the long term, I think the benefits of this deal more than outweigh the near-term drawbacks. And with shares trading at 22 times next year's expected earnings -- a reasonable premium given the company's market-beating growth -- I think any patient, long-term investor would do well to have PayPal as a core position in his or her portfolio.